a note from apple seeds: Fun magic tricks for your little ones! Fun magic tricks for your little ones! Now you can experience the magic of songs for seeds at home! All of these Toy Smith magic tricks are only $4.99…great for birthday gifts and favors or just to make your little ones smile and laugh! Check out our brand new toy & book stores for all of these and more. Assortment of single tricks for your little magician! 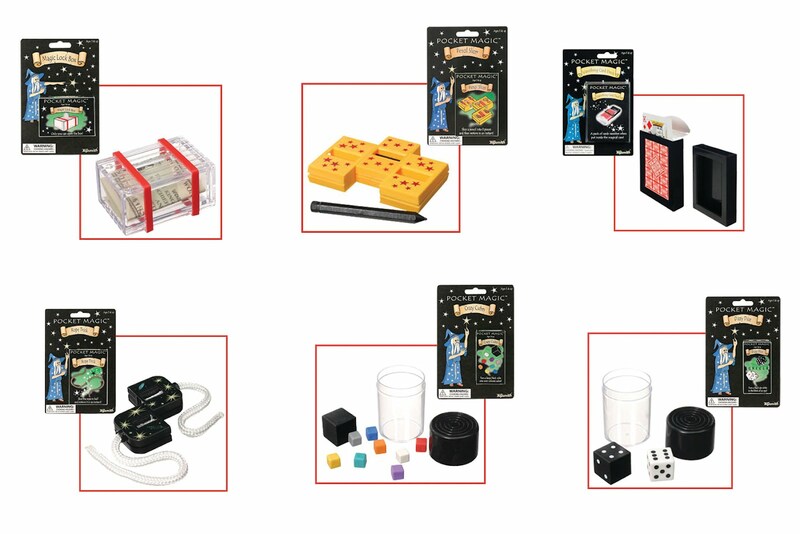 This assortment has popular tricks such as the Vanishing Card Trick, The Pencil Trick, Magic Crazy Cube, and Magic Dizzy Dice. These pocket tricks are convenient and easy to use and priced at a price that will make a smile magically appear on your face. Put a pack of cards in the magical case and bewilder your friends by making the cards vanish! Part of the Pocket Magic series of amazing tricks in convenient pocket-sized packages. As the rope is pulled through the magic case, it is sliced in two then completely restored. Show a black cube in the clear box and give it a shake. Abracadabra! It has changed into eight multi-colored mini cubes. Show a black die in the clear box and give it a shake - now it’s magically changed to white!